By drawing and printing I reconnect to my experience of being in the living world, while doing science connects me to a global community of people who share my desire to know about the natural environment and care about sustaining it. Story: What inspired the work (a question, a feeling)? Plants fascinate me as a scientist, which is why I'm compelled to research them. Equally, however, I am compelled to make art about them based on an almost obsessive drive to express how beautiful they are. I use infrared imagery in my scientific research work on plant thermal tolerance. In the scientific realm these images provide data. Only after showing these images to non-scientists did I start to appreciate how beautiful data can look. 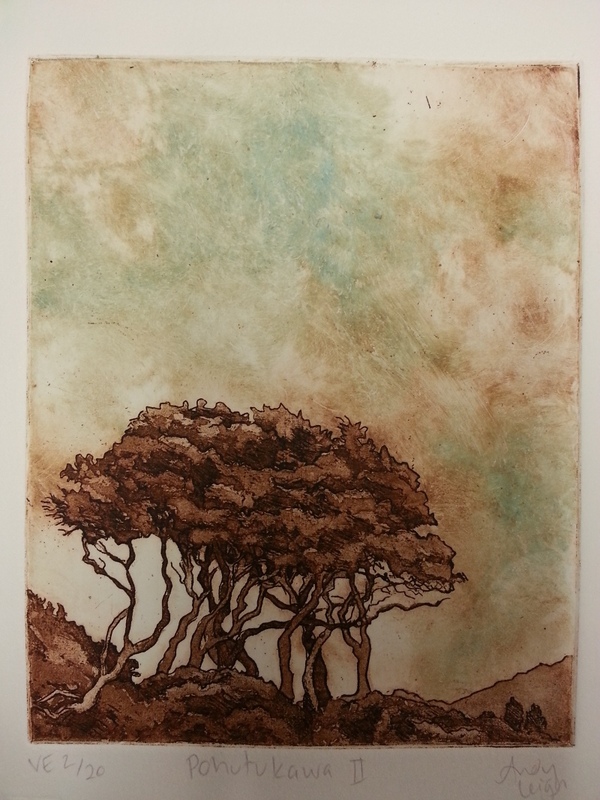 Etching: on zinc plate with hand-wiped tone. Thermograph: an image made using an infrared camera, i.e. taken in the infrared wavelengths. This image shows the viewer only the temperature variation within the picture frame [compare with a photograph: an image made using a regular digital camera, i.e. taken in the visible wavelengths]. Acknowledgements: Who supported the work, financially and in kind? Who contributed data, stories, art, design? Thermal camera loaned by Prof Marilyn Ball, ANU (data collected by me). 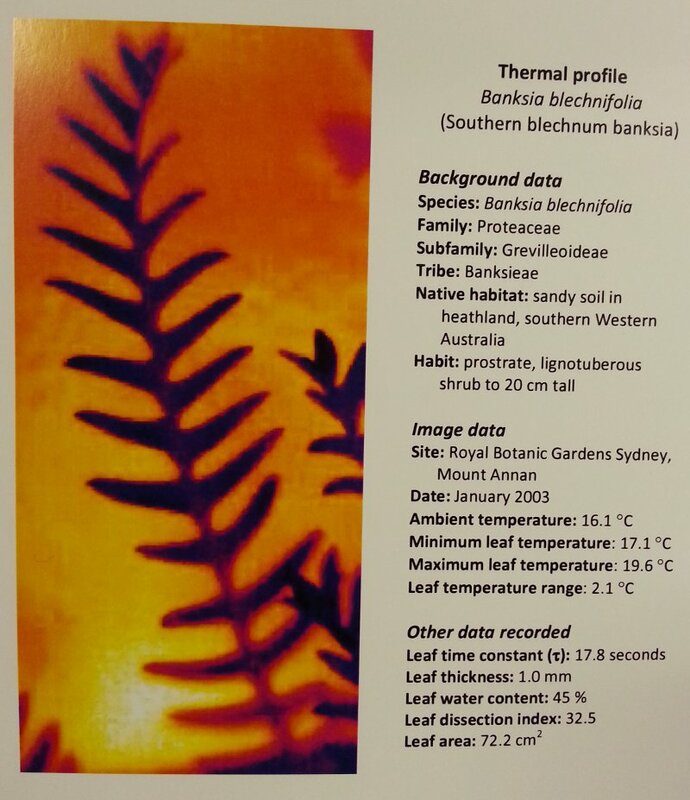 I am a plant ecologist with particular focus on arid regions and how plants tolerate extreme high temperature stress. Also an artist, moonlighting at the Pine Street Creative Art Centre - making prints to maintain sanity. The living world stops me in my tracks - making art is my way of trying to articulate the wonder I feel every time my feet hit the soil. Natural forms and the processes that shape them inspire my work as a scientist, educator and artist. Since a childhood spent surrounded by eucalypt bushland, a sense of wonder and curiosity have inspired me to understand how nature works. By drawing and printing I reconnect to my experience of being in the living world, while doing science connects me to a global community of people who share my desire to know about the natural environment and care about sustaining it. I am a plant ecologist in the School of the Environment at the University of Technology, Sydney, where I research and teach. I am fascinated by the relationship between plant structure and function and compelled to understand particularly how plants survive extreme heat stress. High temperature extremes are predicted to increase in both intensity and frequency in the future and we don't yet know how plants will adapt to cope, nor if all of them will. I focus on desert and semi-arid environments, where organisms often live on the edge of biological tolerance, something that fascinates me. To support theoretical and laboratory predictions, I am a strong believer in field research, which more closely represents how organisms respond to stress in their natural environment. I took an unconventional road to becoming a science academic at UTS: a BA (Visual) was followed by several years traveling in Africa and Europe, then returning to university as a mature age student to do a BSc (Hons) and PhD in Ecology, Evolution and Genetics. Although apparently contrasting educational pathways, I see science and art as being entirely complementary, one informing the other on many levels. As a tertiary educator, I love nothing more than bringing students, many of whom have never been outside the city, into the environment to learn about it by experiencing it. The aesthetic beauty and physical presence of the landscape pervade the senses and, for many students, provide the entry point for learning about the environment. The most rewarding experience for me is to hear a student say: now I understand. What people, papers, books, exhibitions, or other things inspired my work? Contact me by email if you're interested in seeing more of my work or buying any.